On the occasion of Gasworks‘ re-opening after a period of renovation, artist and critic Paul O’Kane visits the space and remembers its influence on his career and outlook. As part of the AICA International Congress this week, a reception for AICA members will be held at Gasworks this Wednesday 28th October 2015, from 6:30pm. It’s a shameful truth that you often neglect amazing facilities that are right on your doorstep. It could be the closest gallery or museum or gallery to you that you often overlook on your way across town to see this or that. Maybe we just like to travel for our delights, but there is something wonderful about being reminded of what you are missing locally. GASWORKS is an organisation with which you have had a relationship of some kind ever since the mid 1990s. At that time you had just gained your NCTJ journalism qualification, finally got something published, and sworn to dedicate your writing to black and Asian artists working in London and who might otherwise go unrepresented, undiscovered or unsupported. Your first ventures appeared in a black woman’s magazine, ‘PRIDE’, as a little art column set among the fashion tips, soul music news, and body cream and hair product ads. Your job was to find, write about and photgraph one black woman artist every month and this led you into dialogue with an amazing, quite shy but big-hearted art world, hidden behind, underneath or within the increasingly big, bold and brash 90s (so-called) ‘London art world.’ You discovered Iniva (The Institute of International Artists), which then had only a modest floor of offices behind Charlotte Street. You discovered AAVAA (The African and Asian Visual artists Archive) as well as traces of CAM (The Caribbean Artist’s Movement) and other black British artists groups going back to the 1950s. You discovered The October Gallery, 198 Gallery, The Africa Centre, The Brixton Art Gallery, The Brunei Gallery (at SOAS), Third Text journal and much more. You also had the privilege of aiding a little in the historicisation of black art in Britain by contributing to the Routledge ‘Companion to Contemporary Black British Culture’ (2002). Then there were the joys of discovering GASWORKS and its international residency programme. It was perhaps your own sense of isolation, as a working class Anglo-Irish, Essex council estate born artist, feeling battered and bludgeoned into living pretty much as a hermit by all the power, confidence and wealth you had encountered in a series of culture shocks, after setting out naively to carve out a career as an artist in London. It was perhaps this personal ‘difference’ that made you want to support those on whom the light of success was not shining so brightly, and those who, like you, lacked the long-established, largely white, largely English, largely upper and middle class socio-cultural networks, ladders and connections that maintained, and continue to maintain the art world as a largely privileged playground, rather than being a real ‘difference engine’ capable of transforming a progressive and dynamic society, empowering truly new and truly different voices and perspectives. Meeting the artists and enablers at GASWORKS and at the other organisations listed above; talking to them and writing about them; was a refreshing and inspiring experience, enabling an ‘international’ perspective that could zoom you out of all the traps, mazes and dead-ends in which you so felt incarcerated; enabling you to see, instead, possibilities, passions and alternatives that you had long believed existed but hadn’t yet found much evidence of. But most of all it was the warmth and friendliness of the art and people you met that was the greatest and most memorable discovery. These artists were no-less ambitious than others you had met and worked with, and yet their ambition was often modestly set aside in favour of things that were more fundamentally important, and with which those who struggle the most and the hardest tend not to lose touch with. Things like generosity, time, hospitality, mutual respect, lack of pomposity and hierarchy and excellent good humour. I met artists who had grown up under apartheid in the monstrous ‘architecture’ of Soweto; artists from elsewhere in impoverished Africa, the Caribbean, in Central and Latin America, in Asia and the middle East. Sometimes their works were not as empowered and resolved, ‘current’ and ‘savvy’ as the latest London based MFA rising star graduate, but that was just the point, they offered, shared and exchanged fresh, vulnerable, personal explorations and speculations while hungrily and modestly inviting feedback from an entirely new audience. GASWORKS is funded, and its building now owned (as a newly refurbished, state of the art gallery, archive and studio space) by Triangle Trust, an international organisation that has, for decades, been supporting aspiring international artists in many countries and continents who would otherwise have little or no access to the kinds of professional facilities and opportunities it provides. This week you were starting to wonder what you would write about for your blog when you found yourself walking by GASWORKS and popped in. It was wonderful to see the new conversion and you bumped into both the director and the architect as they checked over any tiny details, seeing how the new building was bedding itself in. The stunning new spaces played host to a brave, compelling and quizzical exhibition ‘Sincerely Yours‘ by South African artist Kemang Wa Lehulere. You are not a fan of press releases, which, though they do provide essential factual information and guidance for visitors, often seem to divert you from the real point of an encounter with contemporary art, i.e. to respond to and interpret as directly as possible the art and the artist without presumption or prescription. Contemporary art has to be more of a question than any particular answer, and so it proved to be here. 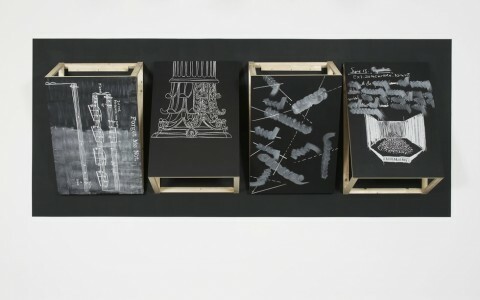 The first thing to say then about this work is that it is crisp and meticulous in its preparation and presentation, in ways that points to the artist’s profound engagement with their environments, ideas, materials and processes. The messages and meanings here may appear arcane to an eye unaided by written explanations but you can nevertheless translate a certain, carefully controlled appeal, complaint and enquiry pervading the work. For example, what might it mean to recycle used school desks and seats, or to carefully render images on blackboards, in a country that threw off the wicked rule of apartheid in a revolutionary wave partly inspired by a march of schoolchildren, many shot down by police, who asked only to be taught in English and not the Afrikaans language of their oppressors and abusers? Such a question seems to be more valuable than any particular answer, and that is just how contemporary art should operate. Kemang Wa Lehulere, Do not go far, they say, again 3, suitcases. earth, grass, spray painted ceramic dogs, 2015. Commissioned by Gasworks. Courtesy the artist. Photo: Andy Keate. 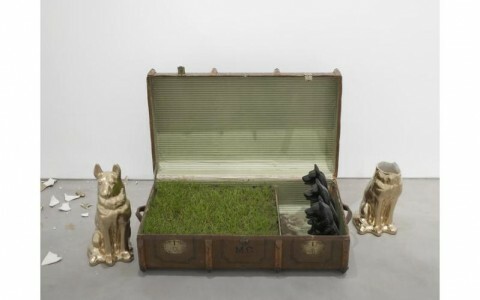 Again, what might it mean for gauche, kitsch, gold coated plaster Alsation dogs to guard over a suitcase full of carefully cultivated turf? ‘Go figure’ as the North Americans sometimes say. What might it mean for some of those dogs to also appear in black, as the guarded or as guardians, or for them to be smashed to pieces on the pristine new floor of the gallery? Finally, what might it mean, and what value might it have for the artist to bravely chip away at the brand new, perfectly plastered white walls of this brand new galley, carefully constructing the image of a postage stamp of a country that does not exist? Think about it, please do. Contemporary art and the questions it provokes should stay with you long after you leave the gallery. GASWORKS has been revamped and its mission perhaps revised on one or two occasions since you first encountered its (originally more ramshackle) facilities back in the mid-90s. But this show demonstrates and proclaims what have always surely been its noble aspirations, i.e. to provide a conduit to, from and between, art and artists in London and artists of and from other worlds, other art worlds, thereby intervening and stirring-up a mix of values, cultures, methods and languages, questioning the established and the new, shaking London out of any fixed contemplation of its own undeniable importance. As you leave you feel a touch of shame at how long its been since you’ve visited GASWORKS, and you vow to try to visit more regularly from now on.